The Undead Lair is a mid-level dungeon that is a source of Potions of Wisdom and the Doom Bow. Entrances to the Undead Lair are dropped from Ghost Gods. The Undead Lair Key is available in the Nexus for 100 . See the Undead Lair Guide for a complete walk-through on the dungeon and all its enemies. Very powerful traps are camouflaged into the stone floor tiles. They can be destroyed but will detonate when a player gets TOO close to them. The boss drops a weapon that does the third most damage per shot in the game, the Doom Bow, and its re-skinned version, the Bow of the Morning Star. Strategies: The Undead Lair is a fairly hard dungeon for players who don’t have decent gear or defense. Otherwise it is a decent dungeon and a little bit of a challenge. 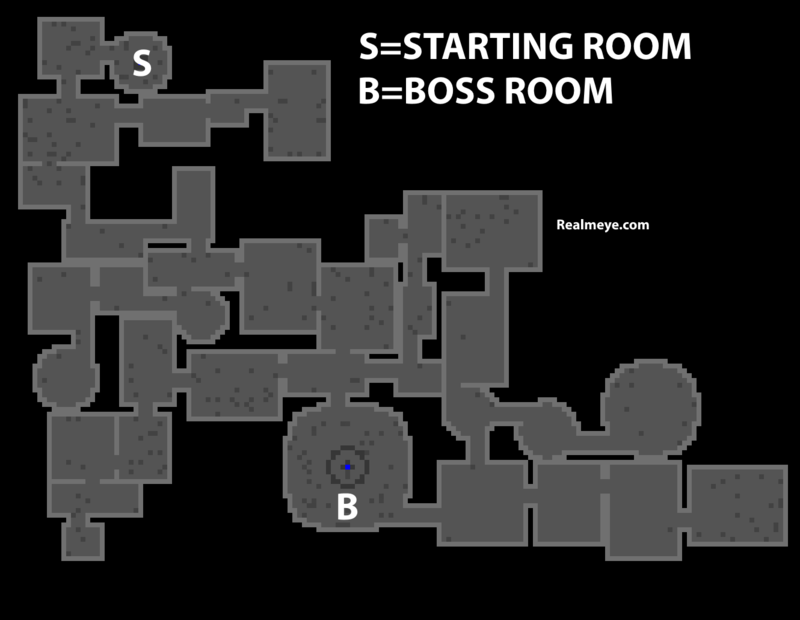 There are always 9 rooms between the start room and the boss room, not counting either. The key to survive is to, stay aware. Lair traps, vampires, and sometimes slimes in the Lair can harass you and potentially kill you or hurt you pretty hard. Don’t rush into an unexplored room, enemies in the Undead Lair vary greatly. Some enemies inflict confuse, quiet, or slow. Some employ brute force, while some use speed. You never know what lies at the corner. Be prepared, just in case you get harrased by monsters, make sure you have at least 2/5 of your HP remaining. Note: These tips are general tips for all classes, and all players. Also, if you have lots of defense, some tips may not apply. When the boss is dead and most players leave the dungeon, it’s often a good idea to stay inside by exploring the rest of the rooms if trying to acquire mid-tier items. When approaching each room carefully, it’s very likely that you’ll face only a handful of enemies at a time whose attacks can be dodged with some skill. Your biggest threats are brown and black slimes in this case as they can’t be dodged easily nor can be lured out of their locations. Trickster and rogue can use their abilities to eliminate them while wand-wielding classes do slightly outrange them. A good class for this dungeon would be assassin due to his ability he can clump up everybody and throw his powerful poison to do crowd control while using his dagger (hopefully you have a bone for this dungeon) to kill of large amounts of minions at a safe distance. If you plan to rush as a rogue, be very careful around the lair blast traps, as uncloaking on top of them will likely seriously hurt or even instantly kill you. As a slower or melee class, this threat is minimal. Another good class would also be archer and huntress due to their piercing on the bow against slimes, vampires, groups of mummies and skeletons. As long as you have a t8 bow or better, it shouldn’t be as hard. Their quiver and trap can get multiple targets, the trap has a better chance against septavius and his ghostly minions because of its burst when an enemy falls upon it causing slow to give you a chance against them before they can get too close.